I received an email last week, through one of my other websites, from a company that specialises in e-cigarettes. E-cigarettes are electronic cigarettes that are used to help quit smoking, as they’re better for you than smoking real cigarettes and you can even smoke them in pubs and bars as they don’t actually produce real smoke (many produce a vapour). Anyhow, I digress; a firm that sells these e-cigarettes contacted me because of the recent Google updates that crack down on dodgy links, spam links and irrelevant links. It seems one of my websites has been linking to their website in an act of SEO spam… me? Surely not! Indeed not, as SEO spam isn’t something I engage in. However, many other people who claim to offer SEO services aren’t so ethical, and a Transformers forum I run had been used by this firm’s SEO company to build dodgy links. A profile had been created on the forum, linking to the e-cigarette website in the home page field of the profile. This is a common spam practice and one that many dodgy link builders and spammers have used for many years. Spam link builders will create profiles on forums, adding links to the target of their SEO, and often never intended to even post a single thread. It’s one of the easiest ways to build worthless links, and one of the lowest pieces of link building spam. Google has recently made some major changes to their algorithm and we are taking action to remove certain links in order to keep within their Webmaster Guidelines moving forwards. 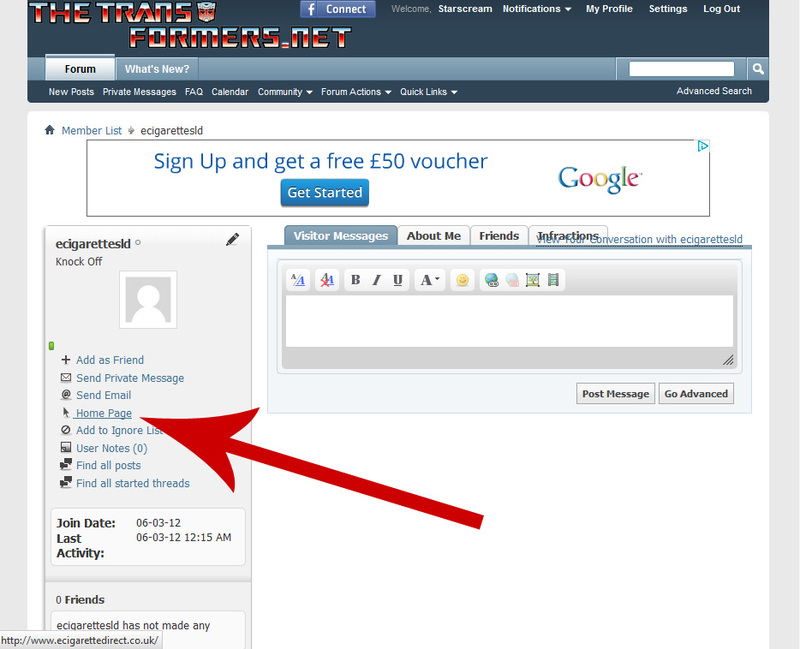 As a result of this action please can you remove the link from your page and let me know when it’s been removed. This all seemed fair enough. They had probably received a notification from Google about unnatural links and, as Google requested, were trying to get them removed. In our mutual interests I have removed the link by deleting the profile, but I did ask them which SEO company they used and who was responsible for this spam. They stated it was webpromotionuk.co.uk – an SEO company based in Birmingham, run by a chap named Steve Hill. Steve – this spam link to ecigarettedirect.co.uk was only added in March, so whether you’re building these links yourself or (as is more likely) outsourcing to someone offshore to do them, you really need to change your link building tactics. Things have moved on quite a bit in the field of SEO, and spamming the crap out of one of my forums isn’t going to get you anywhere. Previous PostCSA worker steals money from parentsNext PostUp, up and away!